August | 2010 | Chat n Craft - What? I’ve decided to make mine reversible so I picked 2 different fabrics that go with my bias tape and bought a little extra so I could put pockets on both sides. The pattern calls for 1 1/8 yards of 45″ fabric, but I’m going to get 1 1/2 yards because I want more pockets and I think I’m going to get 2 different fabric (1 1/2 yards each) so I can make it reversible. It also calls for 3 1/2 yard of 1/4″ wide Double Fold Bias Tape. That will have to be a coordinating color that works with both my fabrics for me. The pattern also calls for 3/8 yard of 1″ wide flat eyelet. Not sure I’m going to do that until after I pick out the fabric I’m going to use. 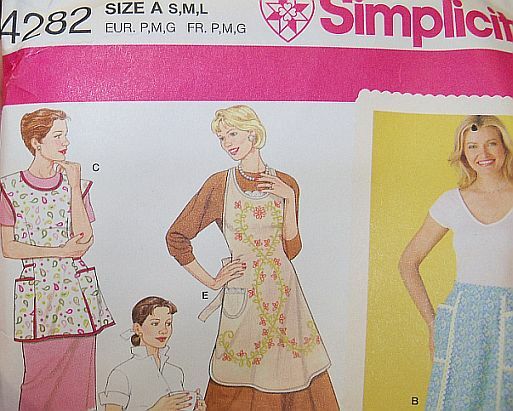 Remember you will be bringing in your sewing machine for that class. So please practice using it before then. Bring whatever thread you want to sew with along with your fabric, bias tape, scissors, etc. It will be exciting to see what fabric everyone brings and how the same pattern will look different on each of us.